Wow, Sean Spicer’s still hanging around the White House? I thought protocol was to give every departing staffer a sandwich and exactly 12 hours to book it out of the country before releasing the dogs on the them, like in Left Hand of Darkness. But no, Spicey’s resignation in July didn’t prevent him from sticking around for an entire month now, lingering like an aggressive smell or a potato-faced goblin you can’t figure out how to exorcise. As you know, Spicer put in his notice following Trump’s appointment of Anthony Scaramucci, who you may faintly remember as an irascible hair plug who was in and out of the job as White House communications director before we even learned to spell his name. That was on July 21. So how has Spicer spent this blissful, (taxpayer-funded?) liminal phase? According to CNN, he’s been...busy? 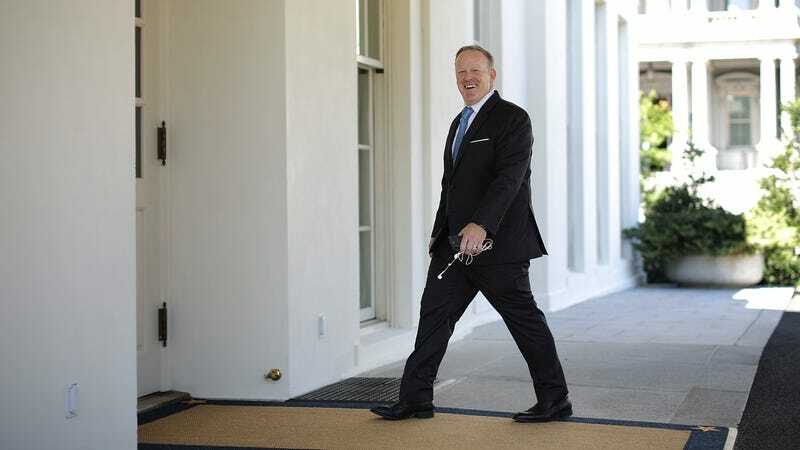 Spicer filled his last four weeks with exploring his next move and wandering the halls of the West Wing. He even recently crossed an item off his personal bucket list — meeting Pope Francis — after he was denied an invitation when other White House advisers met the Pope earlier this year when President Donald Trump traveled to the Vatican. Indeed, Spicer finally got his audience with the pope during a trip to Italy with the International Catholic Legislators Network, whose mission is to unite lawmakers from around the world to “integrate Christian faith and principles with their political responsibilities.” So he HAS been busy! Seriously though, who is paying for this? Anyway, his former colleagues/tormenters plan to throw him a little party tomorrow, probably as a security measure to ensure that he’s actually gone. Hopefully it will be lighthearted and fun and no one will remind him of his relentless drumbeat of devastating blunders, including but not limited to the time he defended Hitler, the time he coined the term “Holocaust centers,” and the countless times he was forced to conjure barely-coherent lies on behalf of his boss. All while wearing probably fatal amounts of bronzer. I hope they give him all the alcohol his heart desires.